Located at the new Children's National Research and Innovation Campus, this facility is critical to accelerating potential discoveries into new treatments. This donation from longstanding partner the United Arab Emirates will help drive pediatric discoveries that save and improve the lives of children everywhere. Dr. Bear Bot, the cardiac intensive care unit robot that helps our team monitor multiple patients at the same time, was officially named on Valentine's Day. I knew Ryan was in very good hands. I really felt like those doctors and nurses saved his life. 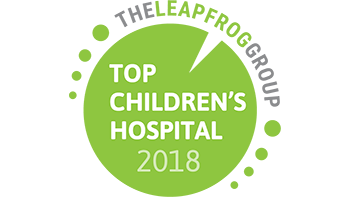 U.S. News & World Report ranks our hospital as one of the top 5 pediatric hospitals in the nation. We’re proud to be named #1 for newborn intensive care and have six additional specialties ranked in the top 10. We have been recognized by the Leapfrog Group 10 times for excellence in quality and safety. We have received this distinction more than any other pediatric hospital since 2007. Only 7% of hospitals nationwide earn Magnet® status, awarded for excellence in nursing and patient care. This designation affirms our commitment to family-centered care.